The two colleagues met in the teachers’ room at Windham High School during the opening weeks of the 1963 – 64 school year; it was Earl Pike’s first year of teaching. He exchanged pleasantries with retired teacher Marion Hodgdon, who was a substitute teacher that day. “No, you teach children. You teach students.” came the sharp rebuke, as Hodgdon stared back with the confident, knowing look of 50 years teaching experience. Hodgdon was born on Oct. 18, 1889 in Windham in what is commonly referred to as the old “Lorenzen house,” next to Field Allen School. In her autobiography, written in the early 1960s, she explained that she attended Windham High School, located at that time in what is now the Windham Historical Society’s Town House Museum on Windham Center Road, graduating in 1906. 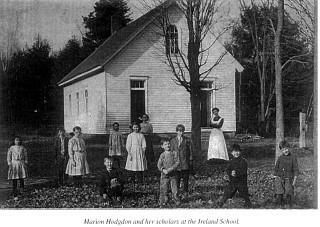 Hodgdon wrote that she knew early-on she wanted to be a teacher, possibly inspired by her early years attending a one-room schoolhouse at Windham Center. “I have (only) pleasant memories of those early years,” wrote Hodgdon. Following high school, four girls from the graduating class of six students would attend Gorham Normal School, graduating in 1908. One year later, another promotion. Hodgdon was assigned the principalship at a North Windham schoolhouse, along with a whopping 20% raise. She now earned $12 a week, which was the top of the pay scale in Windham and in most Maine districts. 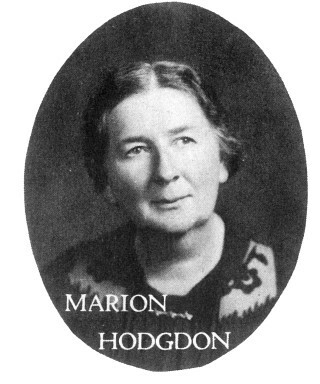 By 1923, Hodgdon said she believed she had “reached my (career) goal,” and was ready to come home. She returned to Windham and became a switchboard operator at the Windham Center telephone office. That same year Marion married Howard Hodgdon and moved to Portland where the family “increased to five, (so) there was plenty to do at home.” She would also be a substitute in the Portland schools. remains of the ancient Parish Church – abandoned, tattered and crumbling. Considering it an eyesore and safety hazard, the Hodgdon’s proceeded to tear it down. But, to many town residents, razing a church bordered on blasphemy. The church came down, but the resulting controversy was troubling for the family. Marion would avoid many opportunities to mingle in the community, preferring to, as she would often say, “mind my own business.” Two exceptions were a garden club and involvement in her town’s storied history. “She had a green thumb,” observed grandson Alan Hodgdon, Jr.; she favored violets and geraniums. Beyond family, gardening and reading (especially Thoreau), local history was a passion. She was heavily involved in the town’s five-day 200th birthday celebration in 1938, helping to publish a thick booklet called “Windham Invites You”, and heading up the pageant committee. It was during those years that Hodgdon was given the nickname “White Fury” by her students. Over her many years of classroom experience, particularly the early ones in a one-room schoolhouse, she had devised a no-nonsense code of discipline. “She had white hair and a low tolerance for people who didn’t follow rules. You never acted up in her class.” said grandson Kermit, Jr. Her passion for local history led her to teach the eighth grade course in Windham history. The textbook, “A History of Windham, Maine” by Frederick H. Dole had been written in conjunction with the 1938 bi-centennial. Shortly before Hodgdon retired in 1960, the Windham School Committee eliminated the Windham history course (doubtless in response to the education scare prompted by the Soviet Union launch of Sputnik). One of her students recalls Mrs. Hodgdon’s anger over the move. “She came to U.S. In retirement, Marion Hodgdon was pressed into service numerous times as a substitute teacher. It’s been said that the regular classroom teacher knew it was folly to leave lesson plans for her. They would be ignored as Mrs. Hodgdon preferred to replace them with Windham history lessons.